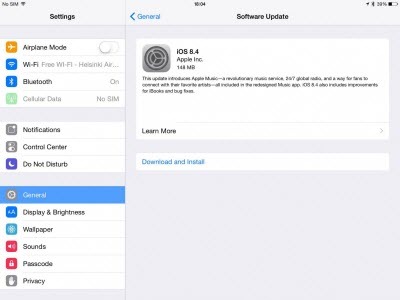 Does Apple iOS 8.4 worth a try? Apple iOS 8.4, dose it worth a try? The day the iOS 8.4 has been released, Apple fanatics rushed to download it immediately as always. More than 40% toting devices had been updated to this most current iOS 8.4 last week, according to CNET. It has been couple of weeks since the debut of iOS 8.4, now we can talk about whether iOS 8.4 worth a try or should you update your iPhone or iPad now as dust settle down and feedbacks from iOS 8.4 device floods in. If you are an Apple fanatic, you would be excited about Apple’s new music streaming service Apple music which comes along with iOS 8.4. And as Taylor Swift agrees to make the new album 1989 available with Apple Music, Apple’s brand new music streaming service does worth a try. However, Apple Music falls behind Spotify and Google Music in regarding to the use of 256kbps AAC files. AAC is a great compression format which is far superior to MP3, but Spotify and Google offer Ogg Vorbis which is a match for AAC and at a higher 320kbps bitrate. In terms of downgrading, Apple’s new release is depressing, as it has stopped signing’ iOS 8.3, meaning anyone who had upgraded to iOS 8.4 and has problems will no longer be able to downgrade to iOS 8.3 and have to wait for a later release. Usually, Apple would give users a month to upgrade to new iOS software before it stops signing the previous version. In this way, users can see if they suffer any bugs and choose to downgrade if they would like so. Apple decided to have cut off the downgrade path to iOS 8.3 just a week after iOS 8.4 was released, which is meaningless at all. Another major feature in iOS 8.4 is an upgrade which moves all audio books from Music to iBooks. This makes sense as it keeps all reading material in the same place. The message crashing problem which allows iPhone users to crash another person’s iPhone by simply sending a text message has been fixed. The text message causes the victim’s iPhone to continuously crash if the text is received while in lock screen mode. The bug also causes the iPhone to reboot without notice. The crash appears to take place only if there is iPhone to iPhone communication, according to 9to5Mac. There are bugs fixed, new features or service added, the biggest problem I guess may prevent you from upgrading to the latest version must be the inability to downgrade. If you don’t care about the new features, and no bug tortures you as others has posted in forums, you can wait for a while before the upgrading, as the upgrading is irretrievable. Source: Apple iOS 8.4: Should You Upgrade?